EFI Fiery digital front end technology. Guy Gecht, CEO of EFI and Benny Landa, Chairman and CEO of Landa Corporation conclude their strategic agreement for Landa's new high-performance DFE powered by EFI Fiery(r) technologyEFI ™ (Nasdaq:EFII) and Landa Corporation have entered into a partnership agreement for the development of a digital front end (DFE) as part of Landa's end-to-end Nanographic Printing™ solution. Landa's new DFE will employ high-performance, EFI-developed Fiery® technology. With this technology, the Landa DFE will offer unique, new functionality for sheetfed and webfed Landa Nanographic Printing™ Presses in the commercial, folding carton, point-of-sale, publishing, and flexible packaging markets. The Landa DFE will stream jobs at full printing speed for 4-8 colour printing with Landa Nanographic Printing Presses and will enable press operators to perform last-minute job changes on the press, to proof jobs and to print rush jobs on-the-fly. In addition, it will collect production feedback from the presses and support closed-loop colour control and inspection. The Landa DFE will support all job dynamics including static, VDP (Variable Data Printing) and EPID (Every Page Is Different) printing. The agreement brings together two pioneering businesses in the digital printing industry with the vision to fundamentally change how mainstream applications are produced. Offering a breakthrough for cost-effectively printing short-to-medium job lengths up to five times faster than existing digital printing presses, Landa's revolutionary presses create demanding technical challenges for processing job data. EFI, as the worldwide leader in colour DFE and digital print workflow technology, is uniquely positioned to deliver such cutting edge technology to meet Landa's stringent colour management, job workflow and integrated MIS demands. EFI CEO Guy Gecht and Landa Chairman and CEO Benny Landa announced the partnership to an audience of 1,000+ EFI customers during the opening session of Connect, EFI's annual users conference in Las Vegas. "Benny Landa is a legend in our industry, and we are excited to work with his company as its exclusive DFE technology provider," said Gecht. "Landa Nanographic Printing Presses have potential to accelerate the migration of mainstream commercial printing and packaging to digital printing. The Landa DFE provides a proven, ultra-high-speed and well-integrated front-end platform that Landa customers will require." 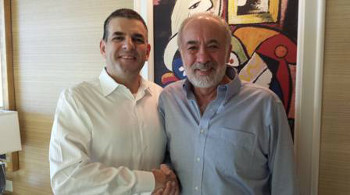 “Our unique Nanographic Printing™ process enables us to offer offset-quality digital printing and a combination of format size and throughput speeds unprecedented in the graphic arts industry," said Benny Landa. "Reaching this remarkable and exciting goal requires partnering with best-in-class providers. That is the reason we chose Fiery technology and EFI as our development partner - to deliver the highest quality ultra-high-speed front-end platform to match the quality and performance of our Nanographic Printing Presses." Landa Nanographic Printing Presses will be installed next to offset presses and use the same substrates. With the new DFE, Landa Nanographic Printing Presses will integrate into a printer's existing prepress, production, and business management workflow and finishing equipment. The Landa DFE will also ensure consistency, accuracy and compliance to leading color standards. It will enable high-speed, variable-data printing on any off-the-shelf B1 format (41 in. / 1,050 mm) substrate. As with current EFI Fiery platforms, the new DFE will integrate with EFI's industry-leading MIS/ERP systems, as well as with leading third-party prepress and workflow platforms, for streamlined job management and processing. Fiery is the first and only DFE platform that carries a 100 per cent perfect pass rating from industry organization VIGC's PDF RIP Audit. The Fiery DFE technology EFI is developing for Landa will use scalable, robust systems offering the processing power needed to drive large volumes of offset-quality digital images, including personalized/variable-data content. The new Landa DFE will enter beta testing as part of the beta installations of the B1 (41 in. / 1,050 mm) format Landa S10 Nanographic Printing™ Press slated for Q4 of this year.